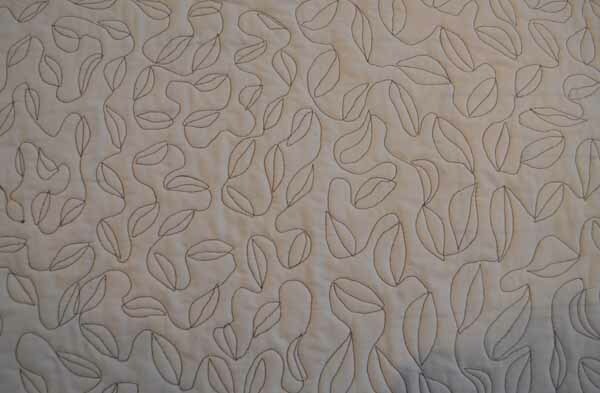 I have been working on this quilt for a few weeks. I was thinking I would have it banged out in a few days. I guess technically it has been just a few days just not consecutive days. 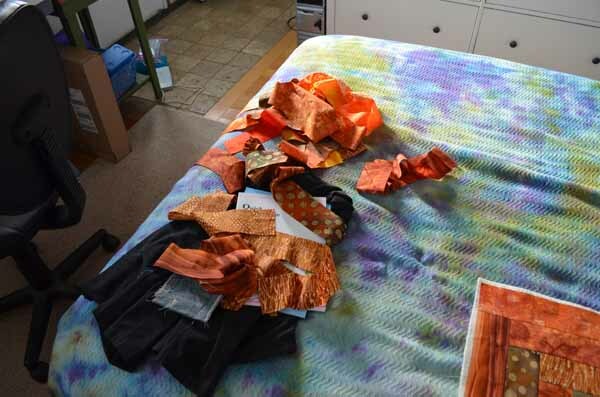 I may have mentioned a long time friend "went out" of quilt making and offered me some of her fabric. Her stipulation was that I use it and not just add it to my stash. I used some of it to make Psychedelic Magpie Sunrise. 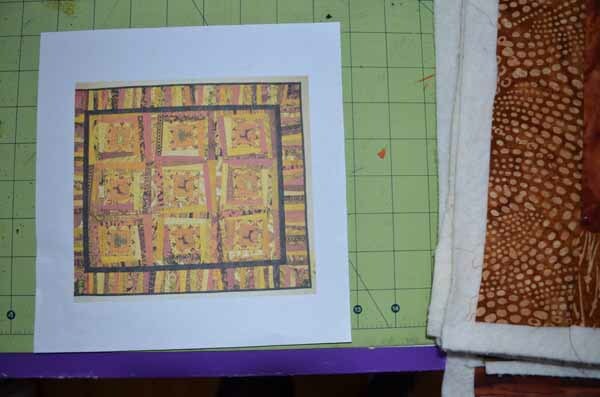 I was also considering some of these southwest colored fabric for Magpie but decided instead to do an entire southwest themed quilt. 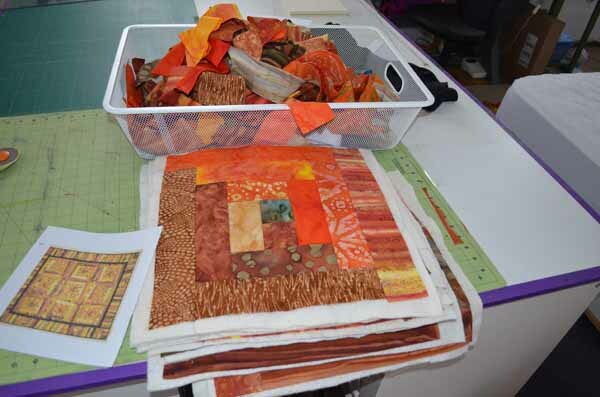 I decided to do another QAYG (Quilt As You Go) lap quilt in browns, rusts and oranges with a flash of turquoise. How to get the flash of turquoise in the quilt was a puzzle until I decided to do a log cabin with the turquoise in the center (chimney) and call it "Turquoise Mine". Remember that really bright turquoise from Magpie? 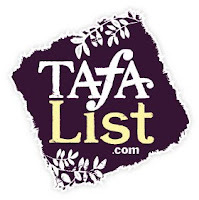 It turned out to be too in your face especially working with batiks. 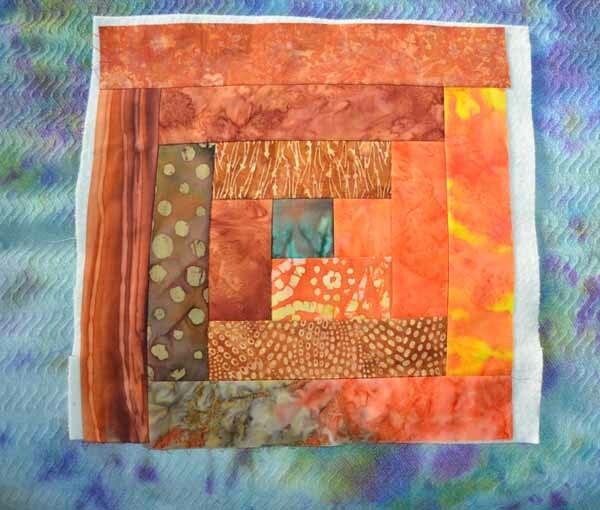 Fortunately I found a piece of brown and turquoise fabric and I fussy cut the brightest bit of 2X2 squares which were still very muted. 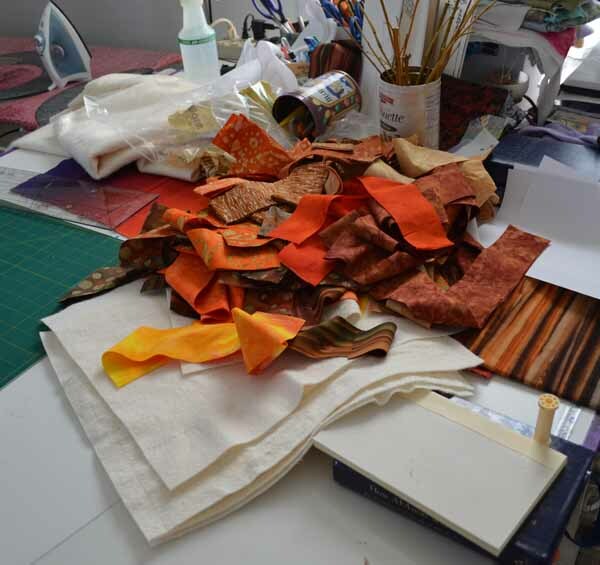 Here I am with two piles of fabric strips: one oranges and one browns on the bed behind my sewing machine. 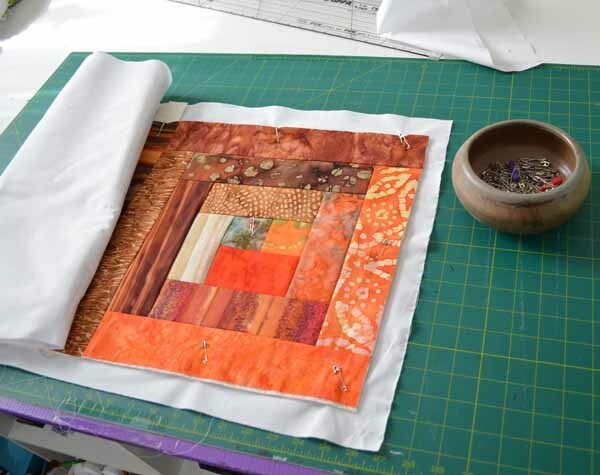 For complete step-by-step directions for making a QAYG quilt, see the tutorial at the top of this page. All the "left overs" are in a basket from my ironing table racks. 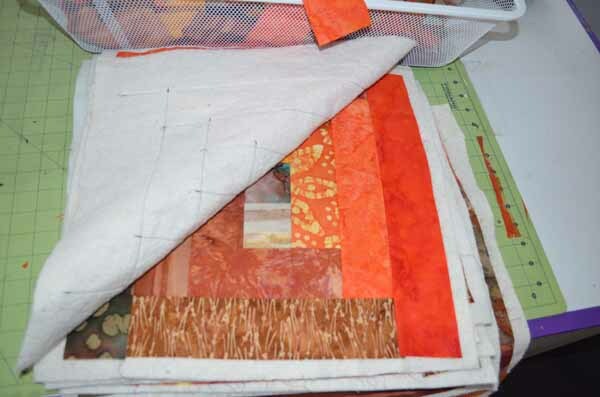 Here are the twelve 14.5" squares. Here I have added the "join" strip with batting on the back. I made a sandwich of the "top" which already had the batting attached with a 16" X 54" long piece of white fabric for backing. Pinning the layers getting ready to quilt (below). 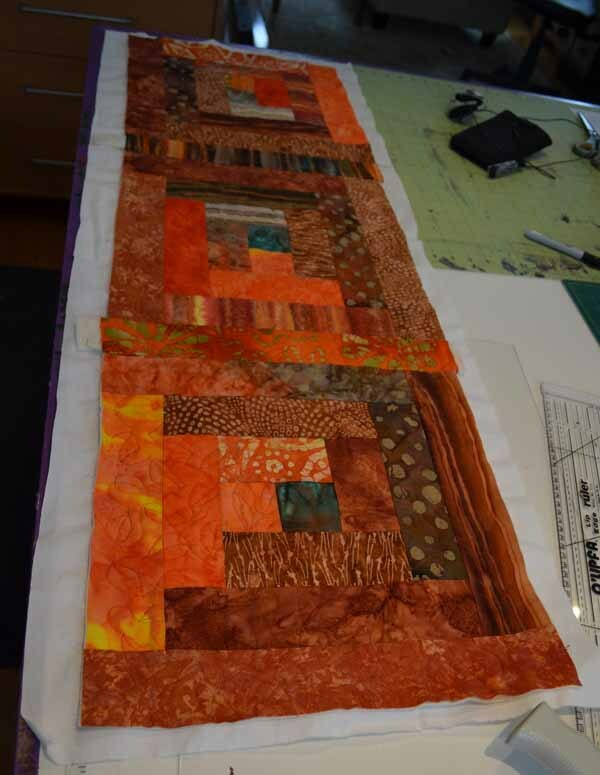 Quilting started. I used my favorite pattern of leaves and vines. 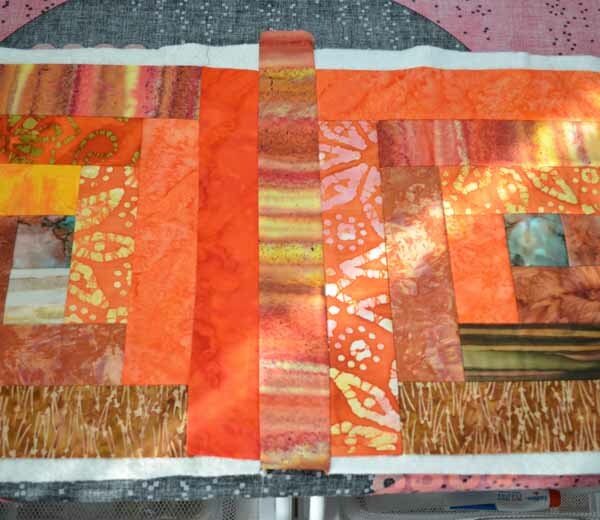 They go well with both a "log cabin" as well as a "turquoise mine"
Today I am working on joining the three strips and making a border. 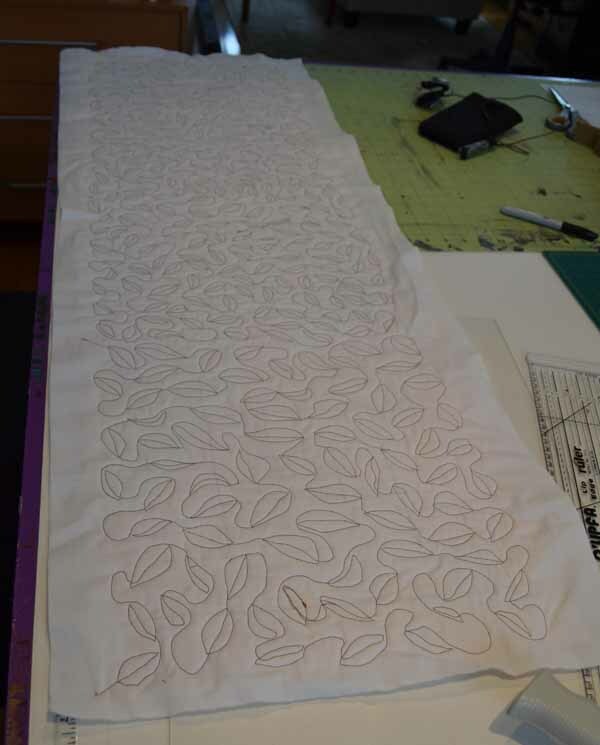 After that, all that is left is binding. Boy, do I love it!!! Wait until you see it finished. 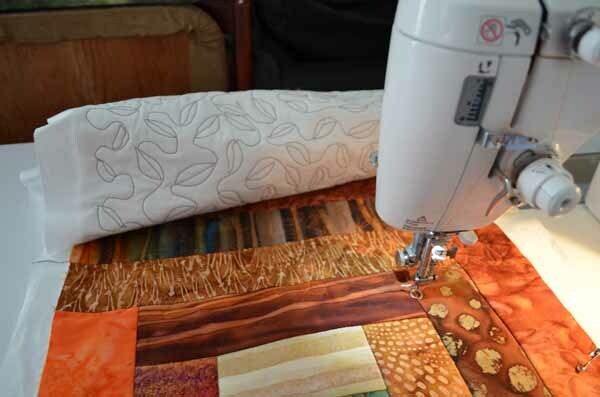 I LOVED this quilt and so did Puppy Love! !